Twitter has restored the account of a journalist following a user backlash sparked by his suspension from the social network. Guy Adams' account was blocked after he criticised NBCUniversal's coverage of the Olympic Games and posted the email address of one of its executives. Mr Adams said NBC had only complained about the message after Twitter alerted the broadcaster to it. Several users later retweeted the executive's email address in protest. Mr Adams said Twitter had told him that his account had been reactivated following "an update from the complainant retracting their original request". A blog post by Twitter's lawyer said it was standard practice to temporarily suspend an account that had posted private information which could be used "to harass or intimidate". However, he added that the networks' workers had strayed beyond guidelines saying they should not instigate a complaints procedure themselves. "We want to apologise for the part of this story that we did mess up," wrote Alex Macgillivray. "The team working closely with NBC around our Olympics partnership did proactively identify a tweet that was in violation of the Twitter rules and encouraged them to file a support ticket with our trust and safety team to report the violation, as has now been reported publicly." NBC paid $1.18bn (£752m) for the US broadcast rights to the Olympics. It later announced it would screen some events with a time delay in order to target a primetime audience. As a result its broadcast of the opening ceremony was shown on the US's east coast with a three-and-a-half hour delay, and with a gap of up to six-and-a-half hours on the west coast. The decision has been attacked by some Twitter users who identified their remarks by adding #NBCFail. NBC formed a partnership with Twitter ahead of the Games to create a page highlighting messages from NBC personalities, athletes and fans during the event. Its commitment to both live and delayed-news platforms may have worked in its favour, with the former helping build anticipation for the latter. NBC has said that a record 40.7 million people watched its coverage of the opening ceremony, saying it was "a great early sign that our strategy of driving people to watch NBC in prime-time is working". He added that Twitter accepted that proactively reporting content "is not acceptable and undermines the trust our users have in us". Mr Adams - who is based Los Angeles - posted a message last Friday criticising NBC's decision to broadcast the Games' opening ceremony with a time delay. "The man responsible for NBC pretending the Olympics haven't started yet is Gary Zenkel. Tell him what u think," Mr Adams tweeted, referring to NBC's Olympics president. He also included Mr Zenkel's business email address in the message. Mr Adams said when he checked his account on Sunday he had received a message saying it had been suspended. "We filed a complaint with Twitter because a user tweeted the personal information of one of our executives," it said. Mr Adams then published an article saying a Daily Telegraph journalist had forwarded him an email from NBC. He quoted an NBC spokesman as saying: "Our social media department was actually alerted to it by Twitter and then we filled out the form and submitted it." Twitter's terms and conditions say posting another person's private and confidential information, including "non-public, personal email addresses" is a violation of its rules. But Mr Adams said he had done nothing wrong, as the address he had used was a corporate one based on the same system used by NBC's other employees and could easily be worked out by "anyone in possession of 30 seconds of free time and access to Google". Mr Macgillivray referred to this in his blog saying: "There are many individuals who may use their work email address for a variety of personal reasons... [We do] not have insight into the use of every user's email address, and we need a policy that we can implement across all of our users in every instance." Before Twitter restored Mr Adams' account many users had come out in his support. "Scandal that someone should be banned for voicing an opinion," tweeted London-based Nicholas Pritchard . 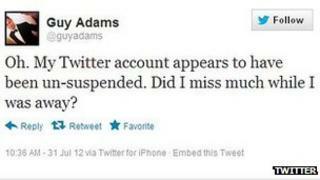 "I think Twitter's suspension of Guy Adams' account hurts its own brand. A lot," posted George Maschke from the Netherlands. "Twitter's suspension of @guyadams jars with company's claim to be the free speech wing of the free speech party," wrote the Guardian's special projects editor Paul Lewis. "I wouldn't have posted the email address. But Twitter's removing his account was outrageous," added Dan Gillmor , from the Arizona State University's school of journalism.